The Streets’ 2002 debut ‘Original Pirate Material’ is one of those rare records that has a story attached for everybody that grew up with it as a soundtrack to their youth. They're the kind of stories that emit starry eyes at after parties and familiar tales of British adolescence. For me, it dates back to working in the warehouse of a long-shut supermarket during sixth form in the tiny northern town I grew up in. I’d already been to my first rave, holidayed in Ibiza (albeit with my family) and found which locals pubs were slightly looser on their ‘Think 25’ policy. Which is all to say that my eyes had been recently opened to the world beyond the small corner of Yorkshire I grew up in, and ‘Original Pirate Material’ documented many of the things I’d become excited about in early adult life because of that. The record, which was on pretty much constant rotation in the warehouse amongst a group of people who prided themselves on disagreeing on music, introduced Mike Skinner as one of the most unique voices in British rap with the inimitable ability to soundtrack every important experience in the life of noughties British youth. Break ups, make ups, work, play, parties, geezers, bouncers, space and time, Einstein, European Bob, UK garage, Kronenberg, Carling, Vodka and snakebite. Follow up ‘A Grand Don’t Come for Free’ landed two years later, with tracks like ‘Fit But You Know It’, ‘Dry Your Eyes’ and ‘Blinded By the Lights’ turning Skinner from cult hero to household name. The trio of albums that followed – 2006’s ‘The Hardest Way to Make an Easy Living’, 2008’s ‘Everything is Borrowed’ and 2011’s ‘Computers and Blues’ – shifted Skinner’s gaze to celebrity culture and coming to terms with growing up, but never quite reached the dizzying heights of their predecessors. Skinner said at the time that he hoped ‘Computers and Blues’, which came at the end of a five-album record deal, would be his last, singing “I’m packing up my desk/Put it into boxes/Knock out the lights/Lock the locks and leave” on ‘Lock the Locks’ towards the album’s close. But even as the final bars rang out on Skinner’s emotional The Streets farewell tour – which took in performances at festival goliaths Glastonbury and Reading & Leeds – it still felt like a project with unfinished business. Six long years later, towards the back end of 2017, Skinner confirmed those sentiments when he announced The Streets’ first tour in seven years, which sold out within minutes last October. But unlike many reunions, which rely entirely on nostalgia to create a quick buck, The Streets’ return came along with new music, with Skinner and co. dropping five tracks since the news of their return broke, including the menacing ‘Boys Will Be Boys’. After a short stint around Europe, The Streets hit the UK for a run of shows in Manchester, Glasgow and Leeds, as well as a homecoming in Birmingham, before closing out with three performances at the O2 Academy Brixton. On the first night, the energy in the room is palpable before The Streets even hit the stage, with wave after wave of tanked up fans flooding into the venue and engulfing the bars to fill up on giant two-pint beer cups. The show starts with the orchestral refrain of ‘Original Pirate Material’ opener ‘Turn the Page’, with Skinner swaggering onto stage dressed all in black and the room exploding into a churlish chant of the track’s string section. “It’s very good to be back!” he grins standing atop a speaker as it comes to a close. After ‘Let’s Push Things Forward’, the four-piece band launch into ‘Don’t Mug Yourself’, the touch paper to send the crowd rapidly over the edge of excitement. Wave after wave of giant plastic cups and flat lager erupt as Skinner sprays one of countless champagne bottles over the adoring crowd. Tops are off. Beers are thrown. It’s wet. It’s wild. The Streets are back. Skinner then professes that they once held the record for the most beers sold in Brixton Academy in one night, before it was broken by The Pogues. “I want my record back!” he yells, but he doesn’t need to do much to urge the crowd to the bars, which have been at capacity for the duration of the show as Brixton Academy feels more like a Saturday night in London than your general mid-week gig. The tracklist pulls heavily from the bands’ first two albums, but the rapid-fire cannon of music dips into their entire discography through the course of the set. An emotional ‘Never Went to Church’ slows things at the centre of the setlist, a touching tribute to his late father, while the opening section ends with the band splicing ‘Dry Your Eyes’ with the Arctic Monkeys’ ‘I Bet That You Look Good On The Dancefloor’, which garners another volley of beer from the baying crowd. Returning for a five-track encore, which includes new cut ‘Boys Will Be Boys’ before the closing trio of ‘Weak Become Heroes’, ‘Blinded by the Lights’ – which both see the crowd raising arms in unison – and ‘Fit But You Know It’. The latter triggers the most deafening sing-a-long of the night, with Skinner, followed by a spotlight throughout, handing over the mic to the crowd throughout the chorus. The sound isn’t quite right for the duration of the show, with Skinner’s vocals low in the mix, but as the 5000-strong crowd belts out every word with him, it does little to derail a triumphant London return. 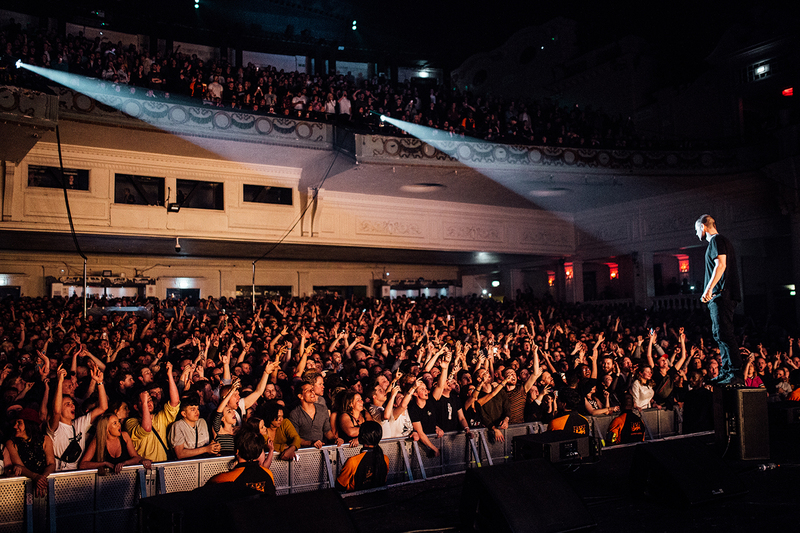 It's also confirmed that The Street’s have reclaimed the record for the most beer sold in one night at Brixton Academy in the hours following. The only question that remains is, after five albums documenting British youth culture during his own youth, does Skinner have enough to say at this stage of his life to transcend a generation with a new album? Of course he will. Welcome back, Mike. We’ve missed you. Want more? Check out The Streets’ first new music since 2011’s ‘Computers and Blues'.